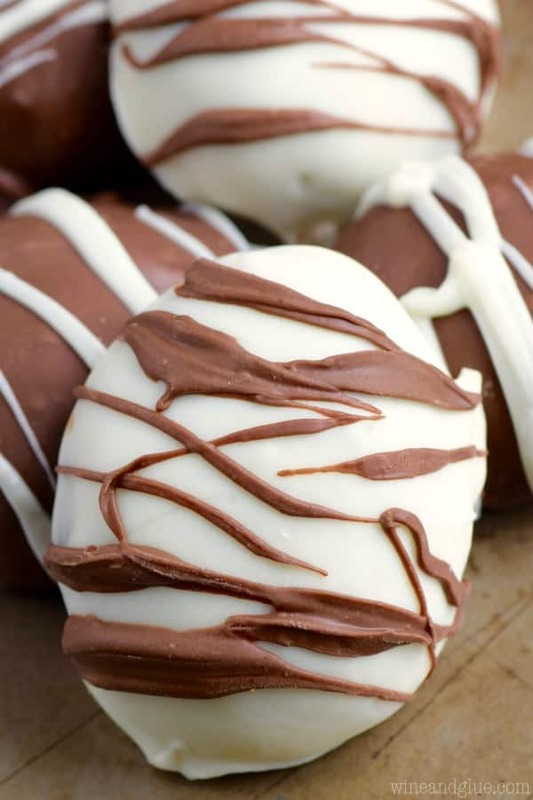 These Fudge Filled Easter Eggs look gourmet but they are actually super easy and SUPER fast! Amazingly delicious too! Just under the wire I have ONE MORE Easter recipe for you! (If you are actually keeping track, that would be Just under the wire I have ONE Easter recipe for you . . . Oops!) These were a last minute brain child that I literally thought of one minute and then was almost finished with the next. That’s how fast they are. So the first thing you need to do is make a batch of simple microwave fudge. It won’t take long, you do it in a big bowl, and the recipe is at the bottom. Then, when the fudge has cooled enough to handle but before it sets, maybe a little less than five minutes out of the microwave, you want to scoop a tablespoon and a half at a time onto parchment paper. 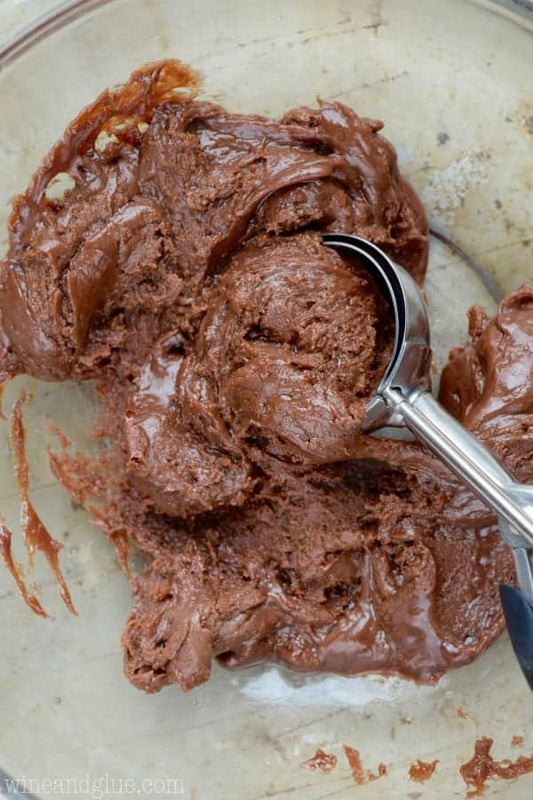 I love this scooper, but honestly you can use a spoon. You might just need to do a little more molding with your hands. Once you’ve scooped it out you want to make it a little fatter on the bottom and thinner on the top. Make it come to a nice peak at the top. Before you know it you will have about 20 fudge eggs . . . less if you eat fudge as you go . . .
Then you refrigerate them for about a half hour and working an egg at a time dip them in melted chocolate and drizzle a little extra on top. And there you have it! These are so delicious, and they really come together easily. Plus, they look absolutely beautiful. You can bring them to an Easter gathering and everyone will think you slaved over them. In a large bowl combine three cups milk chocolate chips, the sweetened condensed milk, and the vanilla extract. Stir to combine. Microwave for 1 minute at half power. Stir. Put back into the microwave in 30 second intervals until smooth. 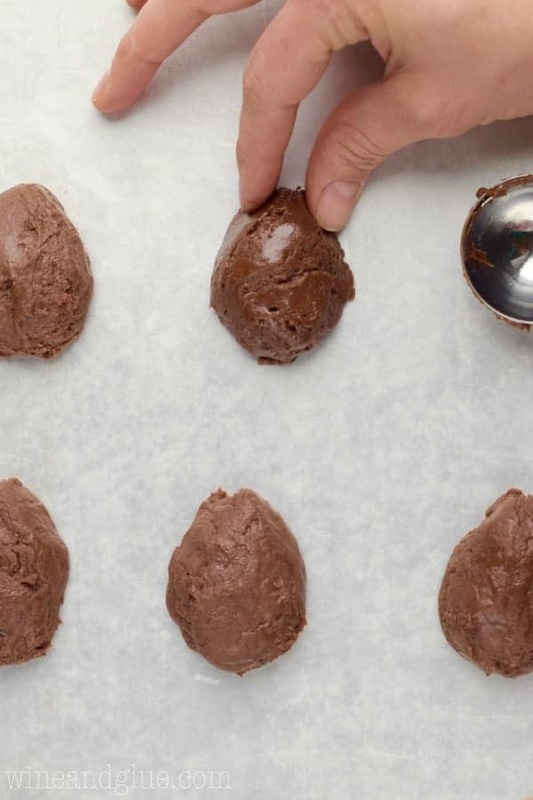 Once the fudge has slightly cooled, about three over four minutes, use a 1 1/2 TBSP scoop scoop out a ball of fudge and place it on parchment lined baking sheet. Form into an egg (see the pictures above) and repeat until all the fudge is gone. Refrigerate until hard, about a half hour. 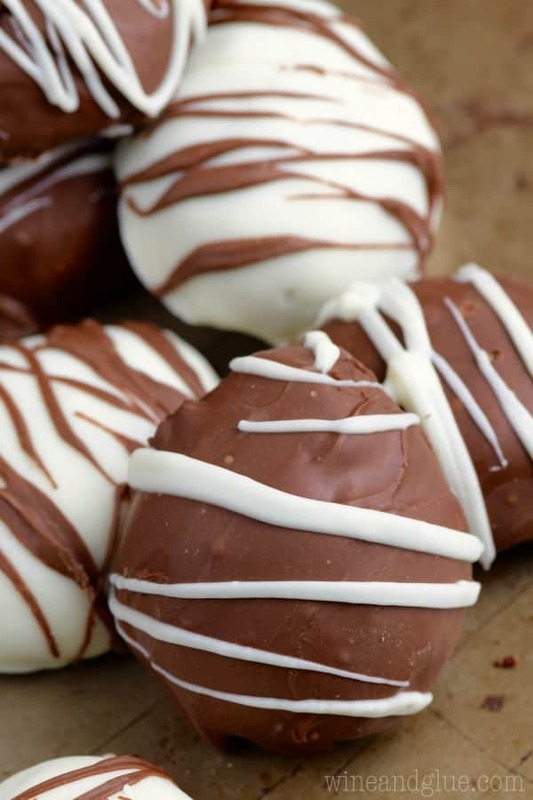 Melt the white chocolate and the remaining milk chocolate separately. 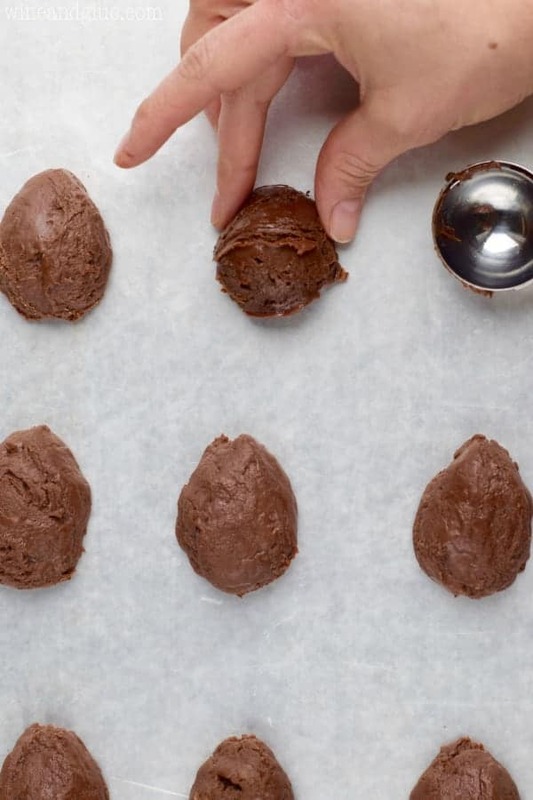 Leave the fudge eggs in the refrigerator and remove them one at a time, dipping them in either the white or the milk chocolate, fishing them out with a fork, and then tapping the fork on the edge of the bowl and putting them back on the parchment lined paper. 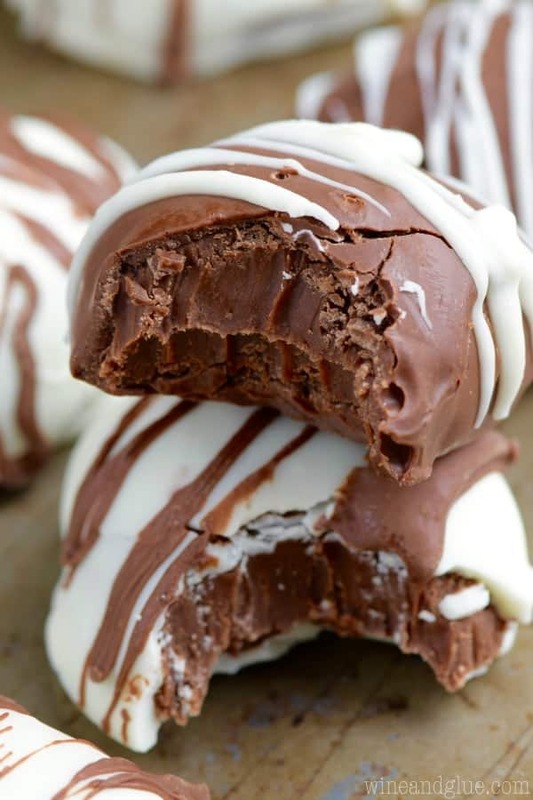 Once the chocolate has dried (it shouldn't take long), drizzle with the opposite color chocolate. 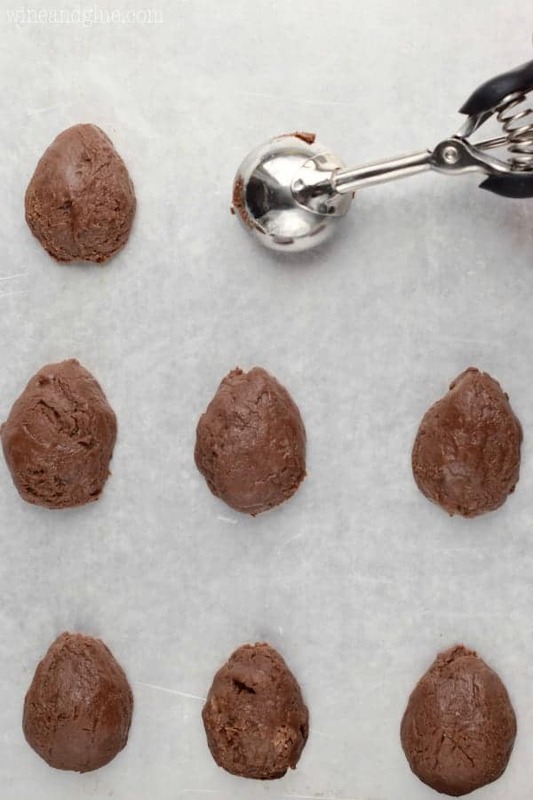 Let the chocolate dry completely before removing from the parchment paper. Store in an airtight container for up to a week out of the refrigerator. 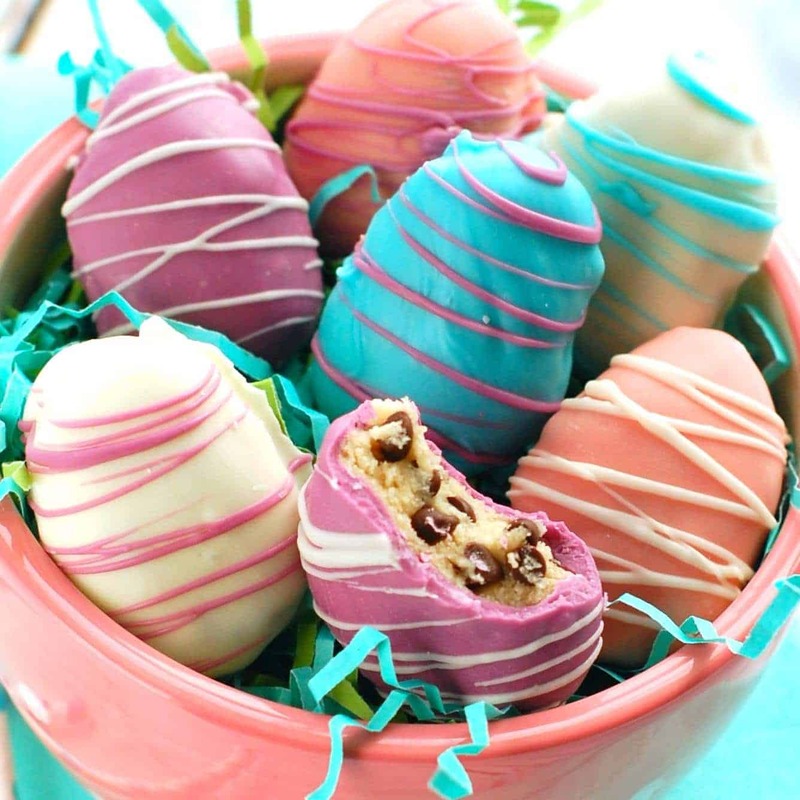 You might also like these Easter goodies!! Mmmm I just want a whole pile of these to snack on this weekend! Chocolate is the best Easter candy, am I right? Especially when it’s a homemade treat like this one. Right, Jenna? I ate waaaaay too many, lol! These are great!!! 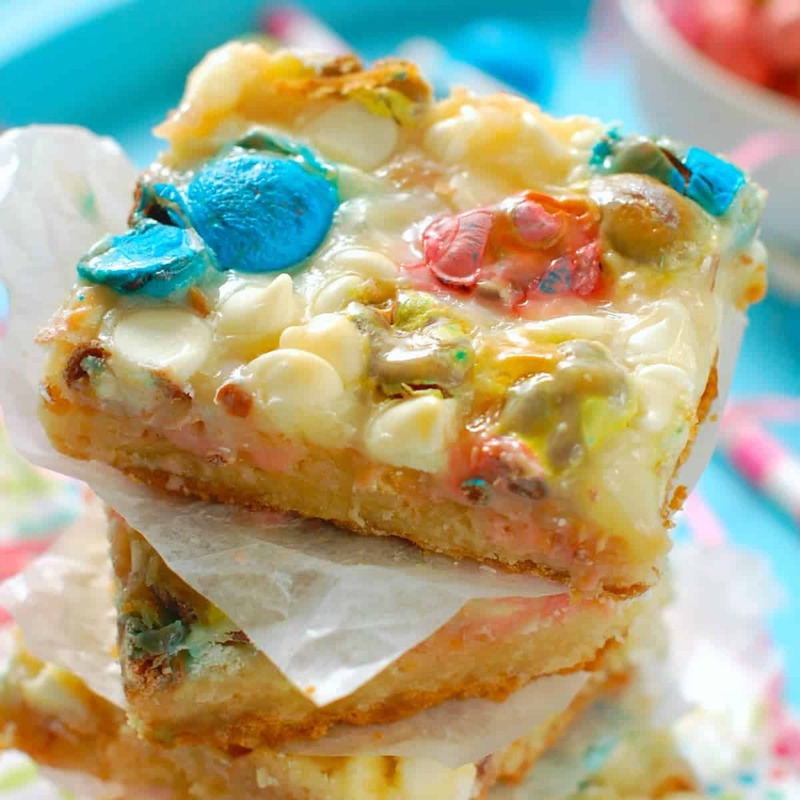 I LOVE fudge…so freaking cute and easy! I’m so sorry Cathy! That’s super annoying. I wish I had some good advice for you, without being there it’s hard to know what went wrong. Hi Mary! About how much powdered sugar did you add? Thanks so much for the tip! Hi Laurie! No milk in this recipe. Step one calls for you to use three cups of the milk CHOCOLATE CHIPS. Hope you enjoy these! I found sweetened condensed chocolate milk.i was wondering can I use that. I haven’t tried that so I’m not sure how it will affect the taste. I just made them.Very good,I love anything chocolate.I added chopped walnuts to half the mix.I also put powered sugar on my hands to roll them so their not to sticky.Thanks will be using this recipe again& again. I do freeze my coconut & peanut butter eggs and they taste great. Was scared to use chocolate sweetened milk.didnt want to mess it up. I’m so glad you liked them Barbara! Can I use melting chocolate wafers instead of chocolate chips ? I haven’t tried that, but I think that would be great for the coating. I would stick with chocolate chips for the filling. Hello! I have a question about your awesome and delicious recipe: the recipe requires a microwave oven but I don’t have the one so my question is can I skip the microwave step or not? You could definitely melt the chocolate on the stove top!